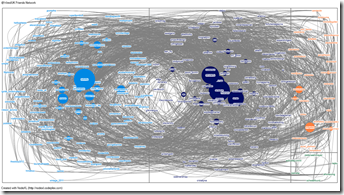 some analysis using the NodeXL add-on for Microsoft Excel (Windows). One of the dangers of SNA is people see images like the one to the right and miss the point of using this modelling technique (the image is from one of my first goes at using NodeXL so I’d be the first to admit there’s room for improvement). If you do there are couple of things to bear in mind. Often these images are exhaust, generated as a snapshot of a visual and/or exploratory analytic. A certain level of literacy is required to understand the underlying structure of the graph. Taking this last point a threshold concept for me was understanding that a basic concept of these graphs are more often than not constructed from an edge list which is essentially two columns of data representing and start point and end point to a node. 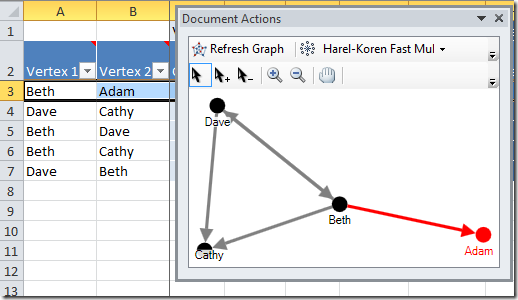 For example, all the names in columns Vertex 1 and Vertex 2 are nodes and each row represents an edge between the nodes so in this case Beth –> Adam generates the highlighted edge. There is a lot more to understand about these types of graphs, but this basic concept means I know if I have any relationship data its easy to graph and explore. At this point it’s worth mentioning the browser plugin SNAPP. The Social Networks Adapting Pedagogical Practice (SNAPP) tool performs real-time social network analysis and visualization of discussion forum activity within popular commercial and open source Learning Management Systems (LMS). SNAPP essentially serves as a diagnostic instrument, allowing teaching staff to evaluate student behavioural patterns against learning activity design objectives and intervene as required a timely manner. 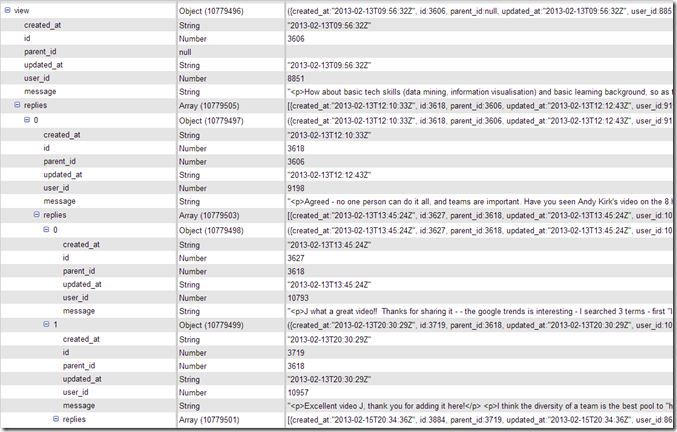 Valuable interaction data is stored within a discussion forum but from the default threaded display of messages it is difficult to determine the level and direction of activity between participants. 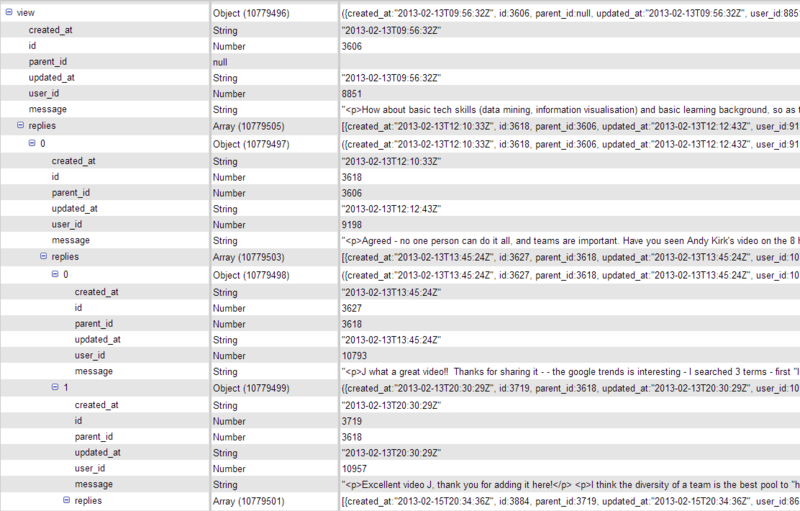 SNAPP infers relationship ties from the post-reply data and renders a social network diagram below the forum thread. 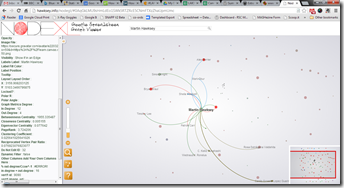 The social network visualization can be filtered based upon user activity and social network data can be exported for further analysis in NetDraw. SNAPP integrates seamlessly with a variety of Learning Management Systems (Blackboard, Moodle and Desire2Learn) and must be triggered while a forum thread is displayed in a Web browser. The paper referencing SNA research supporting these areas was presented at LAK11 (if you don’t have access also available in the presentation’s slidedeck). The paper Visualizing Threaded Conversation Networks: Mining Message Boards and Email Lists for Actionable Insights (Hansen, Shneiderman & Smith, 2010) also highlights simple ways to identify question people, answer people and discussion starters which are all potentially very useful within courses for identifying network clusters individuals might want to join/follow. 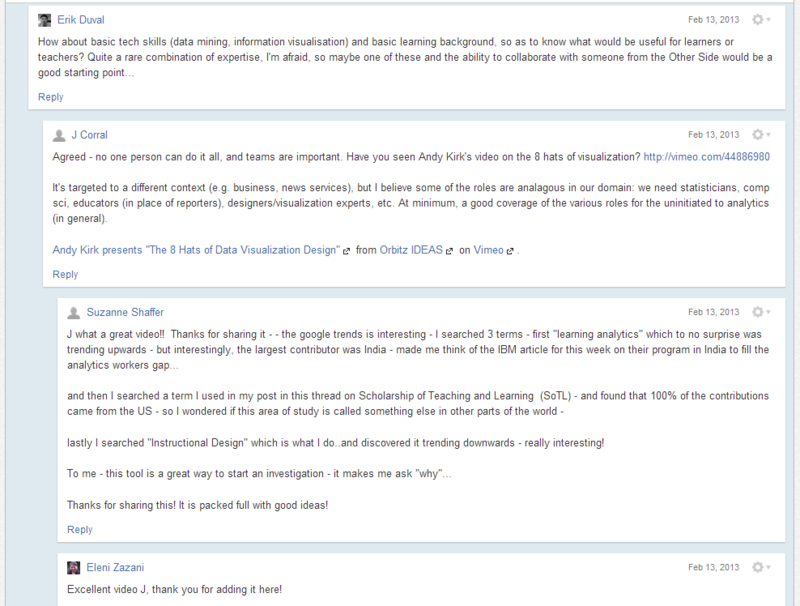 Hopefully with that quick intro you can see there might be some value in using SNA from threaded discussion analysis. Reading the SNAPP overview hopefully you spotted that it currently doesn’t support extracting data from Canvas discussion boards. This is an opportunity to understand some of the analysis SNAPP is doing behind the scenes. The code to do this is available here. 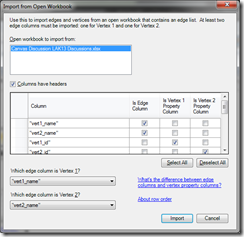 I’m going to spare you the details of the code but here are the instructions is you’d like to export data from other Canvas hosted discussion boards. If you’re not interested in that you can just jump to the next section. Make sure everything is saved in the Script Editor and then Run > getCanvasDiscussionEdges, wait for the script to finish and on Sheet1 you should have a bunch of data to play with. 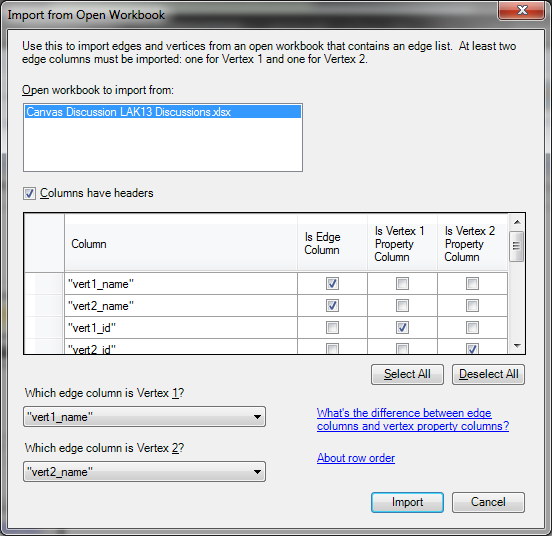 Once imported you can open the Edges sheet, select the created_at column and Format Cells reassigns a date/time format. 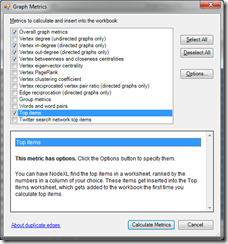 Open the Graph Metrics window and add Vertex in-degree, vertex out-degree, Vertex betweenness and closeness centrality and Top items (in the Top items options you’ll need to add these as the metrics you want top 10s for), finally click Calculate metrics. 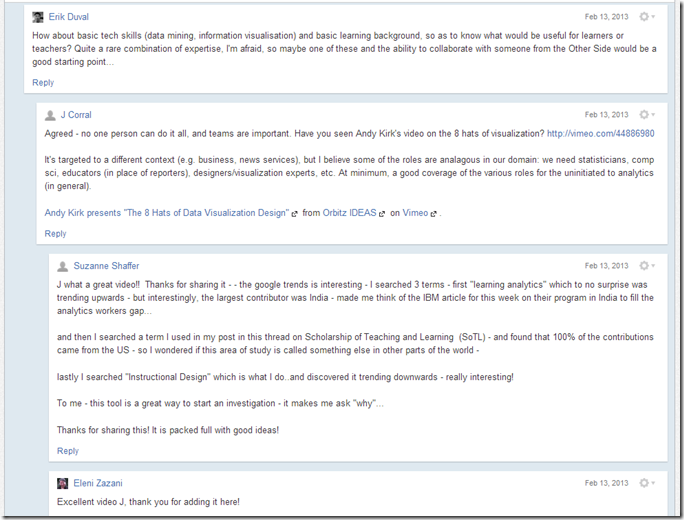 Excluding the pre-course discussion forum and George Siemens the discussions these people have engaged with provide the shortest paths to other people engaging in discussions on the Canvas site. Strategically these are potentially useful people within the network that you might want to follow, question or engage with. Getting to this point obliviously hasn’t been straight forward and had SNAPP been available in this instance it would have turned this in to a far shorter post. Programmatically using tools like R we could have arrived at the same answer with a couple of lines of code (that might be my challenge for next week ;). What it has hopefully illustrated is if you have data in an edge format (two column relationships) tools like NodeXL make it possible for you use SNA modelling techniques to gain insight. (I’m sure it also illustrates that data wrangling isn’t always straight forward, but guess what that’s life). 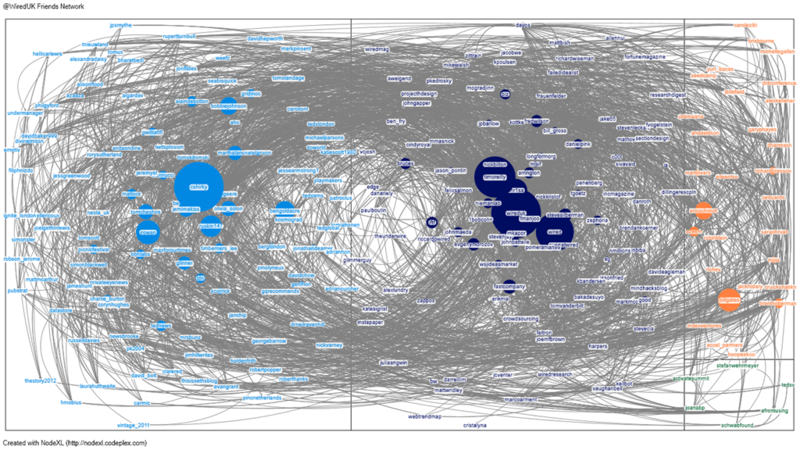 So at this point some of you might be wondering what does the LAK13 reply network look like. I could give you a flat image but why don’t you use my NodeXL online graph viewer to explore it yourself or download the data from the NodeXL Graph Gallery. Appreciate for sharing the information! It’s really helpful! That’s … inspirational, Martin. No other word for it. Your work with Google Scripts has given me new ways to think about facilitating data analysis of powerful response formats (e.g. JSON) for “normal” folks. Thank you for sharing your knowledge! It’s very helpful! I am also taking LAK13. I’ve tried your recipe weeks ago and like to get the final discussion data from the course. I followed your steps but was stuck, again, in couple steps as I did few weeks ago. 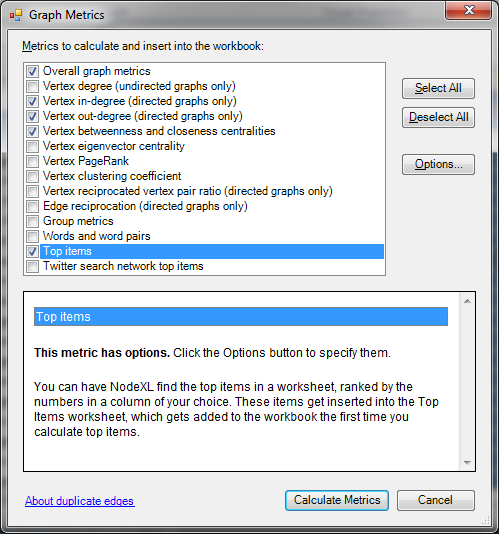 Would you please provide more details for step #6 for NodeXL? 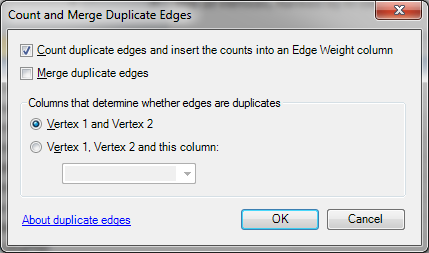 Because I don’t see the “created_at column and Format Cells” in Edges sheet. 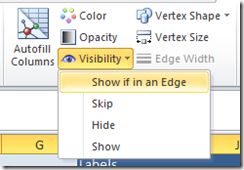 I can see Created_at in ertices sheet though.